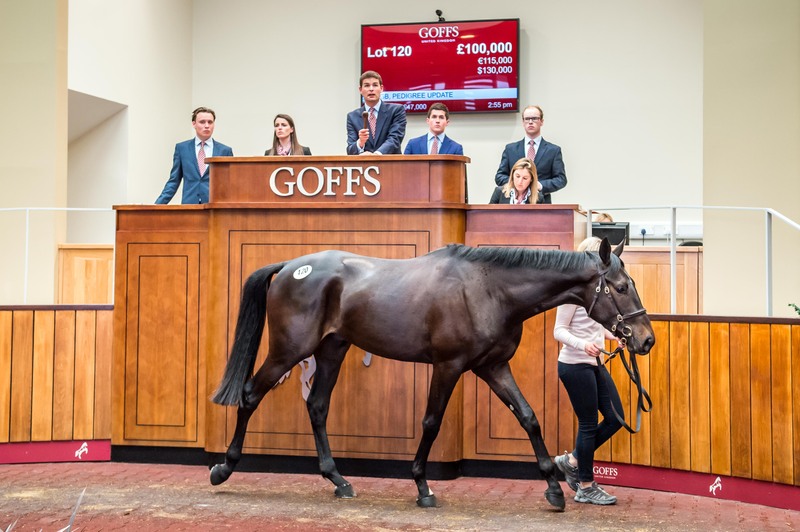 (23 May 2017) A quality catalogue of Stores and a huge crowd featuring the leading National Hunt owners and trainers pushed the Goffs UK Spring Store Sale at Doncaster to new heights today as last year’s record figures were smashed. With last year’s sale seeing the average grow 20% to what was a new record, that figure showed significant growth today off the back of a huge buying bench, up 22% to £28,476 with the median also reaching a new record, up 15% to £23,000. Once again the sale’s top price was shared by two three-year-olds, each selling for £100,000. The first to reach the six-figure mark was Liss House’s Fame And Glory gelding (Lot 105) who was purchased by Gordon Elliott and that was later joined by RH Bloodstock’s Diamond Boy gelding (Lot 120 - pictured) who was purchased by Mouse Morris. In total 26 horses sold for £50,000 or more, up from 13 at last year’s sale, while the clearance rate finished at 89%. “Following huge growth last year, we are truly thrilled with today’s sale which has scaled new heights. For 55 years the Doncaster Spring Sale has been a consistent source of quality and the results today further underline its status as the UK’s leading NH Sale. "Every year we welcome all of the National Hunt fraternity and, with major owners and trainers onsite at Doncaster, the market enjoyed great depth which saw the figures grow to record levels, all driven by a superb 89% clearance rate. The atmosphere both in the ring and around the complex has been electric from start to finish – there really is no sale like Doncaster in May - as befits it’s ‘end of season finale’ billing while “Sunny Donny” has certainly lived up to its reputation.